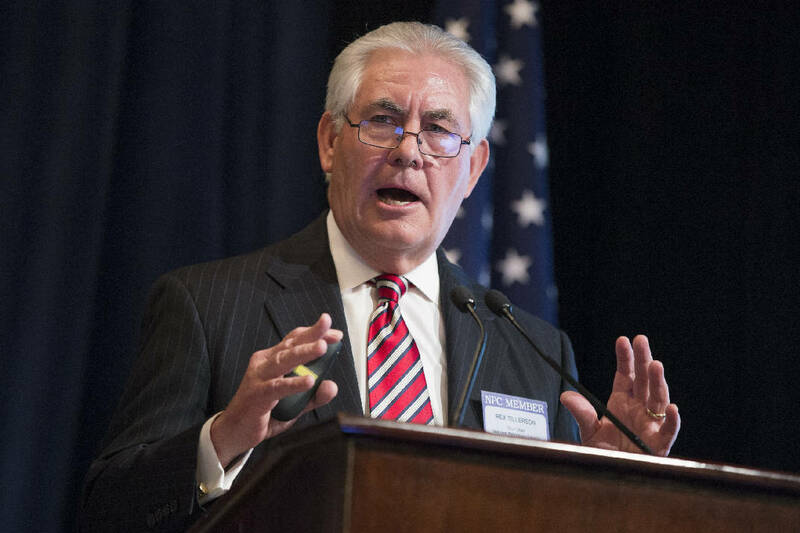 WASHINGTON (AP) — President-elect Donald Trump moved closer to nominating Exxon Mobil CEO Rex Tillerson as his secretary of State on Saturday, a decision that would bring a business leader with close ties to Russia into the Cabinet. Trump has privately signaled that he plans to tap Tillerson for the powerful Cabinet post, but had not formally offered him the job as of Saturday evening, according to people who have spoken with Trump and his transition team. Some advisers worry that Tillerson's Russia connections would lead to a contentious Senate confirmation hearing and keep alive questions about Trump's own relationship with Moscow. Trump and Tillerson met privately in New York on Saturday, their second meeting in a week. The president-elect's transition team said an announcement was not expected over the weekend. Tillerson rose to prominence through Exxon's Russian energy business and was awarded Russia's Order of Friendship. He has argued against sanctions the U.S. and European allies imposed on Russia after it annexed Crimea from Ukraine in 2014. In an interview airing Sunday, Trump praised Tillerson as "much more than a businessman." "He's a world-class player," Trump said on Fox News Sunday. "To me, a great advantage is he knows many of the players and he knows them well. He does massive deals in Russia, he does massive deals, not for himself, for the company." Trump's own relationship with Russia was an issue through much of the campaign. The CIA has concluded with "high confidence" that Russia sought to influence the U.S. election on behalf of the Republican, an assessment Trump has rejected. The president-elect's deliberations over his pick to lead the State Department — particularly his consideration of Mitt Romney for the post — have exposed anew the deep rivalries within Trump's team. Campaign manager Kellyanne Conway warned publicly that Trump supporters would feel betrayed if he were to choose a fierce rival for the post, especially given that some loyal allies — most notably former New York City Mayor Rudy Giuliani — also wanted the job. Giuliani officially took himself out of consideration for the Cabinet on Friday, though his standing had already been diminished. In addition to Romney, Trump has also been considering Tennessee Sen. Bob Corker and John Bolton, the former U.S. ambassador to the United Nations. Trump's team has discussed bringing Bolton on as a No. 2 to Tillerson. The people who have spoken to Trump and the transition team about the State Department decision insisted on anonymity because they were not authorized to discuss the internal deliberations publicly. Internal divisions were also complicating efforts to set up Trump's senior White House staff. Longtime aides are fearful of being left out of the mix as incoming White House chief of staff Reince Priebus builds out the West Wing team. Trump had given Priebus wide authority in the decision-making over White House jobs. But four people involved in the transition said Trump was irritated after learning of his loyalists' frustrations with Priebus in recent press reports. Trump made his displeasure clear to Priebus, who has begun outreach to some of the people who worked on Trump's campaign from the start. Two of those sources said Trump's irritation contributed to a decision to hold off on announcing his pick to succeed Priebus at the Republican National Committee. Priebus, who is fiercely protective of the RNC, is said to back Michigan GOP chair Ronna Romney McDaniel for the job. She appeared at Trump's rally in Michigan Friday night, but no announcement was made. McDaniel, who is Mitt Romney's niece, is still likely to get the RNC job, a Trump transition official said. Priebus was among a handful of Trump advisers who traveled with him to Maryland Saturday for the annual Army-Navy football game. The president-elect was cheered by the crowd as he joined decorated officers in private boxes at the stadium and he pumped his fist in the air a couple of times. The president-elect flew to Maryland from New York, where he'd met privately with Tillerson. Trump is said to be intrigued by the prospect of putting an international businessman at the State Department. He's already selected others with predominantly private sector experience to his Cabinet, including billionaire investor Wilbur Ross for Commerce. Tillerson has held posts in the company's operations in both Yemen and Russia. Success in the latter post required aligning the company's interests with that of the Russian government. Early in the company's efforts to gain access to Russian market, Tillerson cut a deal with state-owned Rosneft. The neglected post-Soviet company didn't have a tremendous amount to offer, but Exxon partnered with it "to be on the same side of the table," Tillerson said, according to Private Empire, an investigative history of Exxon by reporter Steve Coll. Tillerson, who became CEO on Jan. 1, 2006, is expected to retire in 2017. Tillerson's heir apparent, Darren Woods, was put in place a year ago, so there would be virtually no additional disruption to Exxon's succession plans if Tillerson were to become secretary of state. Associated Press writers Ken Thomas and Dave Koenig contributed to this report.